That’s right – it’s a chocolate cake for Valentine’s Day. 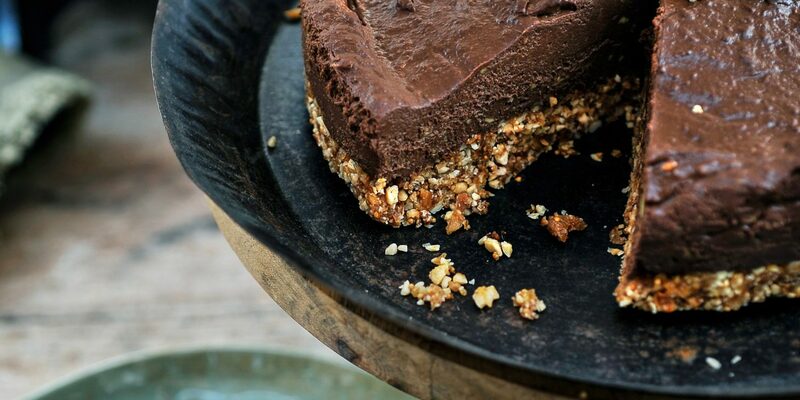 But this isn’t just any old chocolate cake, this is a rich, creamy, entirely plant-based, SUPER delicious and positively good for you cake that’ll knock your socks off. And it’s fully manageable for even the least-skilled cook as it doesn’t even required cooking! No cooking?! Yes that’s right lads – it’s one of those miracle cakes that looks complex but is in fact incredibly easy, and therefore utterly perfect for impressing that special someone. Not least because it’s also packed two delicious favourite aphrodisiac ingredients: raw cacao and avocado. Cacao is bursting with nutrients. Why do we give chocolates on Valentine’s Day? Because cacao contains phenylethylamine (PEA), the chemical in the brain that is triggered when we experience pleasure – and the reason why cacao is so often referred to as a natural aphrodisiac. And avocado – well, apart from the fact that the Aztec word for avocado is “ahuacatl,” which means “testicle” – it contains high levels of folic acid, vitamin B9 (provides the body with more energy) and vitamin B6 (which helps increase testosterone production). This decadent yet un-sinfully healthy dessert can be made ahead of time and kept in the freezer until ready to use so there’ll be no mad last-minute panic. Why not pull out all the stops and serve it with some Booja Booja hazelnut chocolate truffle ice cream and fresh strawberries? You’ll need a 9-inch tart tin with a removable base if possible. In a food processor, pulse the hazelnuts until they are crumbly. Be careful not to process too long (otherwise you will have hazelnut butter!). Add in the rest of the crust ingredients, and process until well mixed, scraping down the sides if necessary. Transfer the crust into a pan and press down firmly. Pop into freezer to set while making the filling. Remove the crust from freezer and pour the cream on top of the crust. Smooth over with a knife or the back of a spoon until evenly spread. Place in the freezer for 2 hours to firm. Before serving, remove from freezer and allow to sit on the counter for about 5-10 minutes*. *Note: Leftovers can be placed back in the freezer.